A mum says she thought her daughter was going to die as she was savaged in the street by a neighbour’s dog. Keaton West, 16, had a huge chunk of flesh ripped from her leg after the animal escaped and set upon her, a court heard. 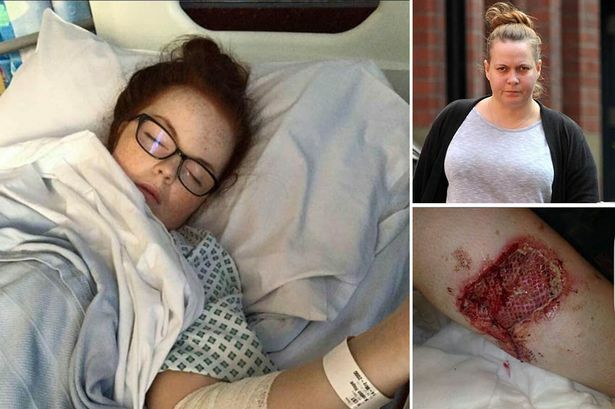 Keaton’s mum and step-dad were also bitten and hurt in the incident in Sale which will leave the teenager scared for life. However her family say they feared it might be much worse. She was speaking after the dog’s owner, Jessica Hinds, 36, also of Ascot Avenue, pleaded guilty to having the dog, described as a BOXER, dangerously out of control at Manchester Magistrates’ Court on Tuesday. Keaton’s mum Rachel West, 46, ran out of the family home on Ascot Avenue at around 10.30pm after hearing daughter screaming. She saw the dog ‘locked onto’ her daughter’s leg and along with her boyfriend Mark Jarman began desperately trying to free her. However the animal turned on the pair, biting both of them, and only gave up once it had bitten away a chunk of Keaton’s left calf. Speaking to the M.E.N Rachel said: “It was absolutely awful. “It was just going crazy and was completely locked onto her leg and wouldn’t let go. “We were trying everything I even put my hands in its jaw. “I was petrified. It was literally trying to drag her leg from under her and get her down on the floor. 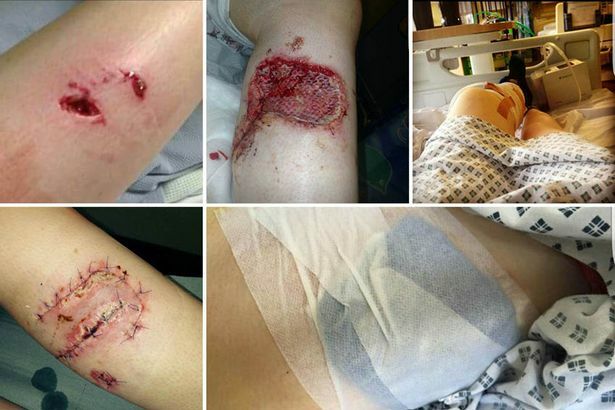 Keaton, a business student, required skin graft surgery, spent two days in hospital and magistrates were told Keaton has needed in excess of 20 further visits after some of her wounds became infected. And Rachel, who also had wounds to her legs and hands, says her daughter will live with the after effects for forever. She said: “She was completely traumatised afterwards, she didn’t want to go out and is still terrified of dogs. “And of course she’s still got this dent in her leg. “She’s still under the care of the plastic surgeon and they are going to review in a year or two. Prosecutors said the dog had become ‘animated’ after a violent episode outside the Hinds’ address earlier in the night. The animal has been kept for the past year in kennels by police but the court was told, despite Hinds saying immediately after the incident she did not want it returned and was happy for it to be put down. Matt Wallace, defending Hinds, said the incident ‘came out of no where’ and the dog had never shown any aggression before. “She accepts this is a serious matter and she was significant remorse.